West Elm's latest campaign digs into social media roots with a predictive spin. The Williams-Sonoma company has been working with Olapic, which launched an advertising technology that pulls images from Instagram, Twitter, Vine or YouTube to create Facebook sponsored ads. The tool relies on a predictive algorithm in technology that crawls social media sites for pictures that the technology predicts will perform best when run on Facebook. The algorithm determines what's in a picture that makes people buy the product. "We've been collecting more than 40 million pictures during the past two years and analyzing how people engage with them," said Pau Sabria, co-founder and CEO of Olapic. "We built an algorithm that knows what's in the picture that makes people click or buy." Sabria calls the tool Predictive Consumer Generated Ads based on an algorithm Photo Rank, which company engineers developed. It capitalizes on artificial intelligence. Some experts suggest that these types of user-generated images would work well to integrate with search data or in campaigns. For West Elm, the predictive algorithm provides a layer of information to match photos to specific campaigns, per Vanessa Holden, SVP, creative director, West Elm. "We're always looking for new ways to elevate and celebrate our customers’ style, and we have and will continue to test user-generated content in other media," she said. The predictive algorithm analyzes the image in the picture or video to determine the likelihood that it will influence the consumer viewing the photo. Brands look for photos and videos that contain images of their products and then Olapic asks the owner of the photo or video for permission to use before placing the images in ads. The photos are segmented into common images. 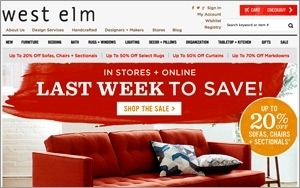 A pixel on West Elm's checkout page tracks consumer engagement with the visual content prior to and after purchase. The technology learns from millions of interactions to determine what makes people buy. Authorship and subject, quality of the picture like composition, and context contribute to the overall influence of the image. Olapic's technology analyzes 46 signals such as filtering data. The pictures without filters generally perform the best. More than 100 brands like JetBlue and Lancome use the technology to find people talking about their brands, but West Elm is the only one testing Olapic's new product. User-generated pictures have once again become more popular with brands. Apple recently launched an advertising campaign it calls "Shot on iPhone 6," featuring favorite images and videos. The company turned over its billboard and print advertising space to iPhone 6 users, relying on them to create the campaign.